Dr. Kokinias and his team can answer your questions about cosmetic or orthodontic care. With proper care and good oral hygiene, a veneer has a lifespan of 5-15 years. Are you looking for a simpler solution to straighten front teeth without having to endure the look of metal braces? If you are unhappy, self-conscious or even embarrassed with your smile, Dr. Kokinias offers a wonderful solution for anterior teeth alignment using clear aligners. Call our office for a consultation appointment to see if you are a candidate for this modern treatment. MTM® Clear•Aligner is designed to correct anterior malocclusion for the 6 most visible teeth on the upper and lower arch. Many adults spend their entire lives covering their mouths when they laugh, smile or talk. They feel stuck because they do not want to wear adult metal braces for years or they are concerned that other corrective teeth straightening procedures could be too invasive or too expensive. MTM® Clear•Aligner is a removable clear tray system appliance designed to move the teeth without damaging the enamel or requiring years of treatment. Most treatment lasts about 6 months. Your smile deserves the very best. When your teeth are properly aligned, it’s easier to brush and floss. You can achieve a straighter smile without metal braces. Most people are candidates for the clear aligners. Find out if you can have your best possible smile. 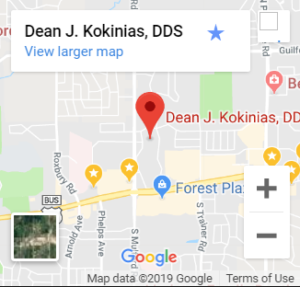 Schedule a consultation with Dr. Kokinias today.